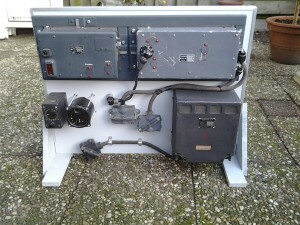 The FuBL2 setup, mostly used in the Ju88 heavy fighter plane, also in the Heinkel HE 111 bomber. This FuBl 2 is a landing aid to the pilot, in landing securely on the landing stroke of an airfield. 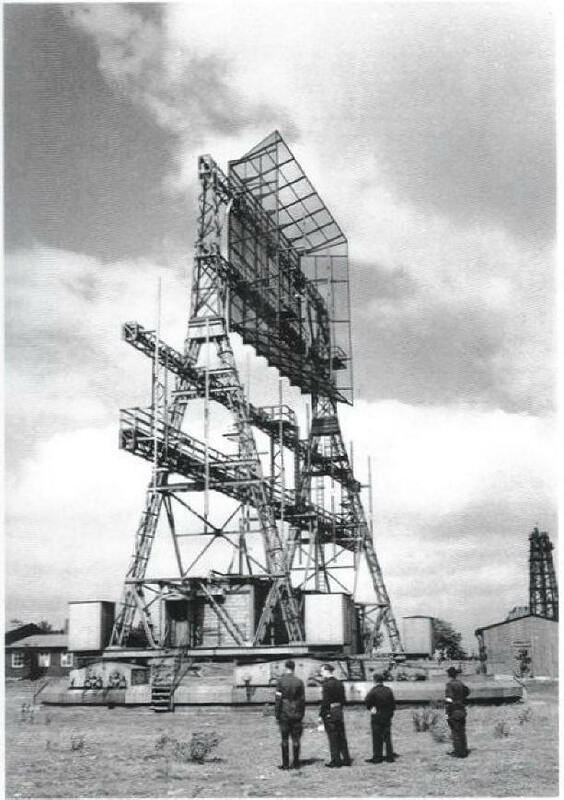 Interested to mention is, that the receiver EBL 2/3 was not only a common landing aid receiver, But the Germans developed another system with the aid of this blind landing system, using the EBL 2, for bombing targets in England, a automatic blind bombing aid sytem. That was in the early days the “Knickebeinverfahren”, working on 30 Mc. A later version was the “X-Gerat”, which worked at a higher frequency of 60 Mc. 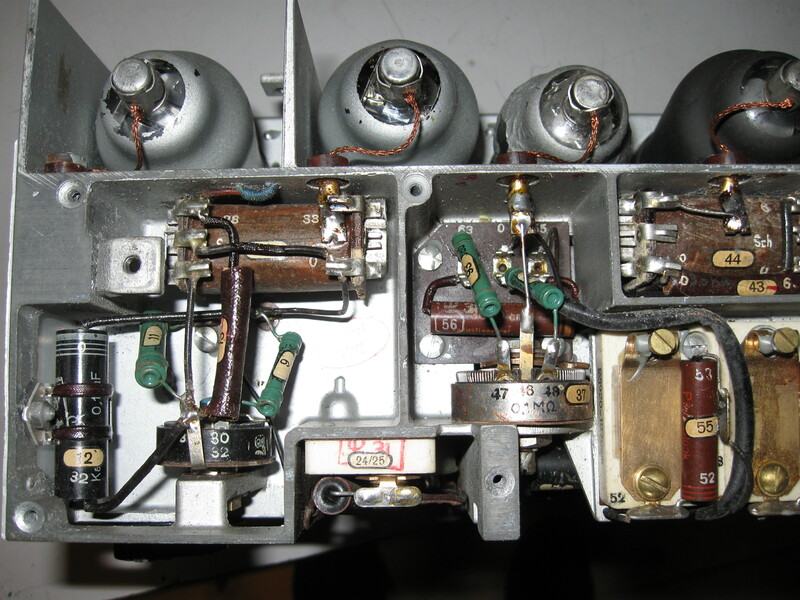 So this makes this EBL2 receiver an historical receiver, because of the special use of it. The antenna system of the Knickebein transmitter. 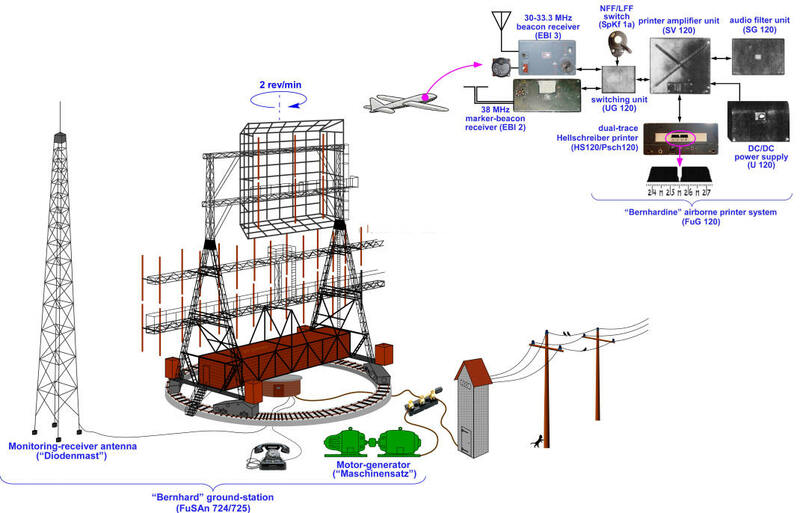 A complex system for small bundling of the radio beam. The principle is, directing a small bundled radiobeam, transmitted by a very smal bundeling antenna system, just over the target to be bombed The bomberplane just had to follow that beam, till he arrived at the target. The pilot could follow that beam on a special instrument, called type AFN1, connected to the EBL2 receiver. This receiver, used in the early days of the development, was tuned then on the frequency of that radio beam Transmitter. The first trials consists of only 2 beams. See the picture below. Two beams were positioned just across the target. 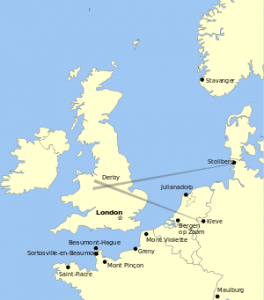 One transmitter in the north of Germany and one in Germany, close to th Dutch boarder. That radio beam consists of 3 parts, eg one narrow beam an two lobs. One outer, a lob with a dotted signal. In the mid, a constant signal ( equi-signal) , the other outer lob with dashes. The pilot only had to steer his airplane that way, he only heard the equi-signal in his headphones. If his airplane was to far away from the equi-signal, he heard either the dots or the dashes. This beam was called the Lorenz beam. 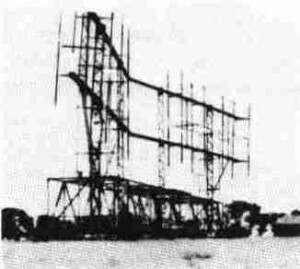 This beam was a standard common used signal, comming from a transmitter, just in line with the landing stroke at the end of it, for blind landing systems. By navigating on a instrument, the pilot could make a save landing on the landing stroke at night time and foggy weather. This in case of blind landing on the landing stroke. 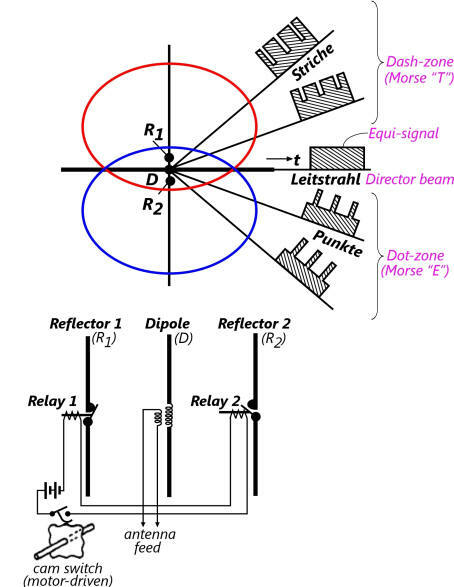 The principle of the Lorenz beam. The 3 typical beams. The mid dipole establish the main beam, equi-signal, the outer , switched reflector elements, did make the two lobs for the dots and dashes. Below in the picture, the antenna system system. A further improved version was the “X-Gerat”? In the first trials, with Knickebein, with only 2 beams, the pilot flew along one of the beams on the equi-signal. Till he approached the the other beam. He heard then first the dotted signal of the second beam, after a while its equi-signal. Now he heard only a mix of equi-signals and released the bombs by hand on the target. He hoped, the bombs were on the target, it was not that secure. X-Gerat was more secure. It used other receivers, see picture below. Also unfortuniatly not mine. It used more beams, see picture below. It used one leading beam, called Weser, just over the target, and three other, called Rhine, Oder and Elbe. The first leading beam (Weser) was in Germany. The other three at the coast of occupied France. These three beams crossing the leading first, just before the target location, viewing from the position of the bomberplane. The crossing of those beams gave an indication of the position of the airplane. First look at the AFN1 instrument in the picture below. There are 2 needles on the scale of the instrument, a vertical one and a horizontal one. The vertical needle of the instrument indicates the first leading beam (Weser), I mentioned. When the needle is just pointing to the dot, the plane is just moving into the right direction to the target. On the left side of the instrument scale, there are 3 dots. The dots gave the position of the plane, when crossing one of the 3 beams. The first dot (Rhine) is a position just close to the target. If the horizontal needle points to that dot, a lamp is lightning just above the centre of the scale. This is the moment, the first hand on the stopwatch is running. After crossing the second beam (Oder), the first hand is stopping, the second hand is starting to run. 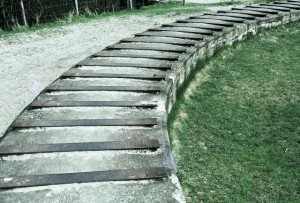 When after reaching the thirth beam (Elbe), the third hand is running, the second stops. After the third hand is reaching zero, they pushed down a knob on a that stopwatch and afterwards the bombs are automatically released and went to the target. This was a much more accurate system then the Knickebein system. They used diathermy apparates from Hospitals, which had about the same frequency of the Lorenz beam transmitter. 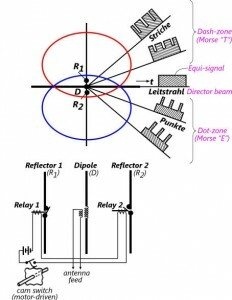 They modified it to the same frequency, modulated it with the dots and dashes signals etc., and sended it by a small beam in the direction of Germany, so simulating a false Lorenz beam. Mostly the German pilots picked up this false signal, and could not find the second one, thus missing the target. The “Knickebein Uhr” or “X-Uhr”. Unfortunatly not in my collection. Another use of the EBL 3 and EBL 2 receiver, normally used for the FuBl 2 installation, is also very interesting. It shows the very big knowledge of German engineers in developing all kind of navigation systems. 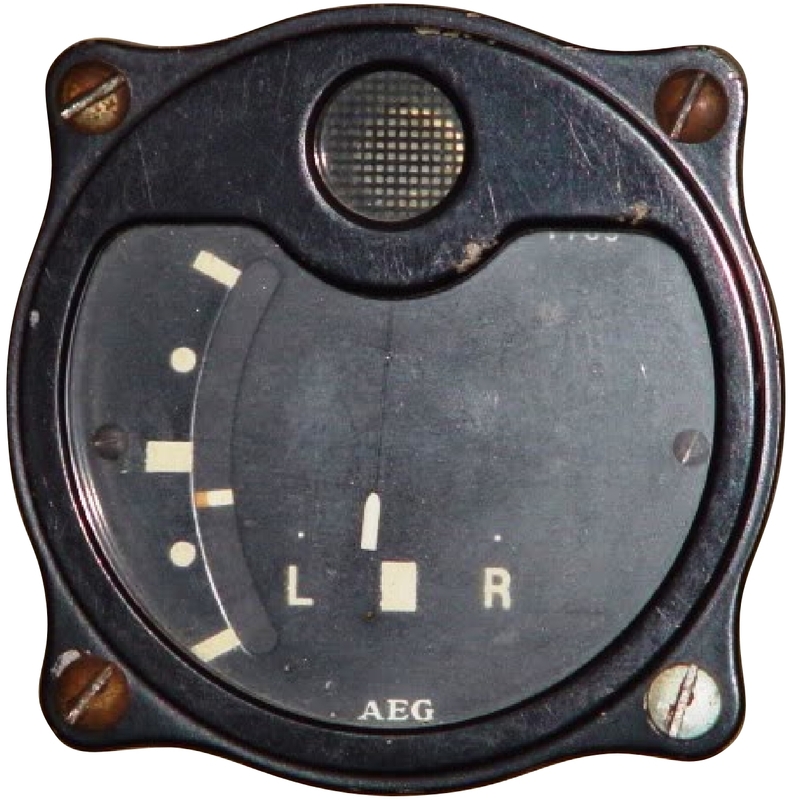 The EBL 3, type H or F, were used in another complex navigation system for the Luftwaffe to assist fighter planes for the interception of enemy bombers. The purpose of using this new system was that, the Knickebein, the X-Gerat and Y-Gerat systems could not used any more because of heavy interfering of British disturbing transmitters, described for instance above for the Knickebein system. They wanted a system, which could not be disturbed, or at least very less. This was called the “Bernhard/Bernhardine” system. 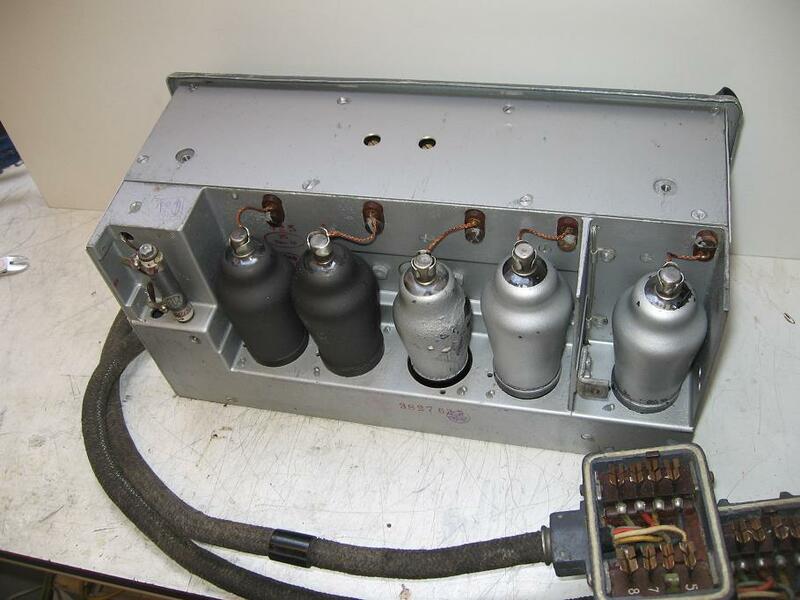 They started to build the systems in 1941 by Telefunken. 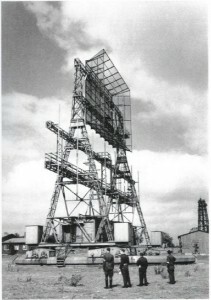 Picture of a Bernhard beacon system, at Bredstedt in the far north of Germany, with its hugh antenna system of 28 m high. You can make an impression of it by comparing it with the persons at the front. Also north west of the Dutch village of Schoorl, at a high dune top at the north sea coast border, the remaining ring of a Bernhard system. Here to be seen a circular part of the rail. Picture taken in 1980. The ring was broken down in the 1990’s however. But on internet, several remaining rings from France, Danmark, Germany, Poland etc. can be seen. The system comprises a beacon station at ground level and a Hellschreiber printersystem in the aircraft. Bernhard was the FuSAn 724/725, the Bernhardine the FUG 120. Why a hell printer system? Hell data is very difficult to disturb. You get only a good data on your Hell system, if the hell information data are just Hell data. If it is not precise, the system does not respond. So what you read on the paper is really true! See picture 1 below the whole system. At the right, of the picture you see the Bernhardine system, with the receivers EBl 3 and EBl 2. 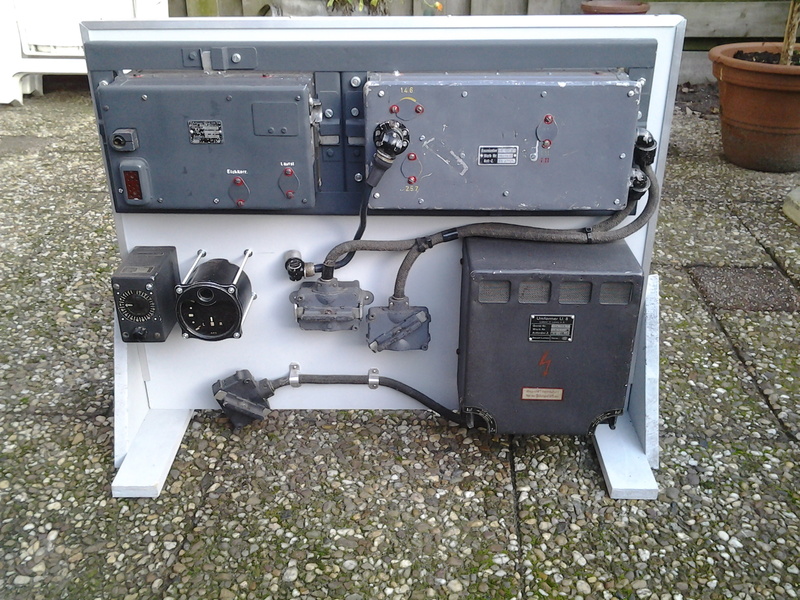 This complete system was placed in the aircraft. The main job of the system was to print the azimuth position on a special Hellschreiber printer. The receiver EBL 3 was a H (hand) or Remote (F) type. The F type had a separate channelbox controll. Different channels could be chosen, the last two were chosen for the Bernhard/Berhardine system. See also the picture of my FuBl 2. 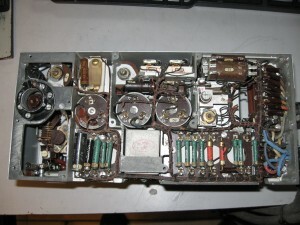 Frequency range of the receivers and system was 30 – 33,1 Mhz. 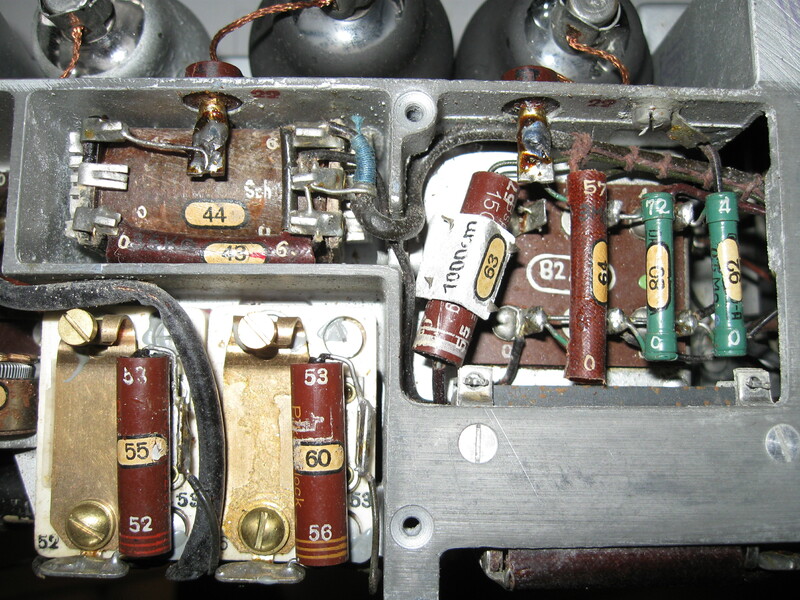 The both transmitters of the 724, did had a power of 500 watts. The power of the 725 was up to 5 KW. 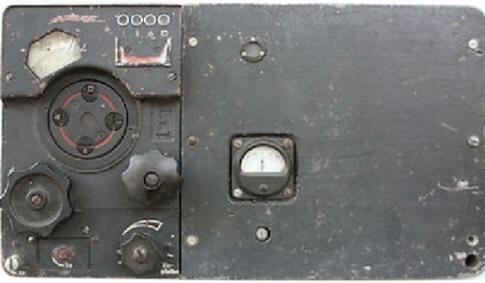 They nearly had the same frequency, about 10 Khz difference, so the signals could be heard easily on one receiver only. 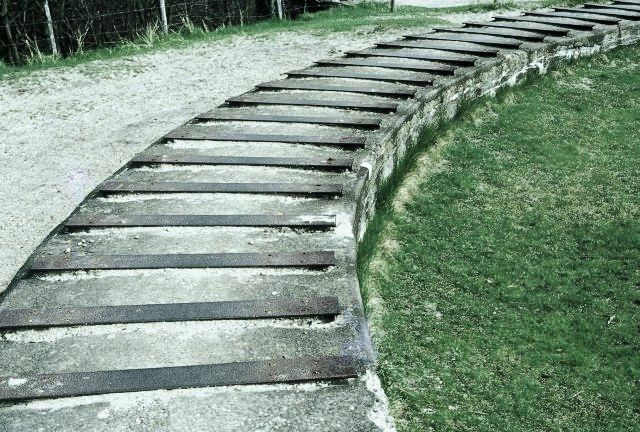 The dimensions of the Bernhard system was about 28 by 35 m. The diameter of the circular rail was 22 meter. The weight was about 120 tons. At the left side of the picture, you see the Benhard system, a very big rotating antenna system, which was driven by two electrical motors on that circular rail of 22 m in diameter. At a speed of two rev/minute. The Bernhard consists of two antenna sub systems, both dipole arrays. 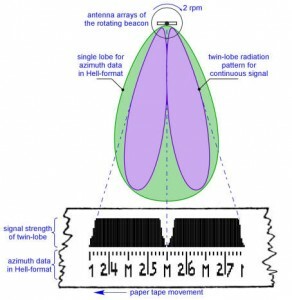 One dipole array of the most lower part of the antenna, is transmitting continuously data in Hell format (identifier and momentary antenna azimuth, or a short text message, coming from one transmitter. The center line of the beam is the azimuth position of the antenna, referring to the null, being the true north. The second larger dipole array field, the most upper section of the antenna system has a twin beam radiation, coming from the other transmitter. The pattern has a small null between the 2 beams. This null is aligned with maximum of the single beam, this antenna sends a continuous AM modulated tone. This position and the dip, could also seen on a remote instrument, the AFN 1. See figure 2 below, to see the different beams. So the Bernhard is the transmitting part with 2 separate transmitters and the Bernhardine the receiving part, with the EBL3 receiver for the azimuth position and/or short messages. 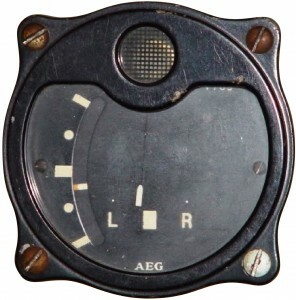 The EBL2 receiver for normal navigation. The Hellschreiber printer in the aircraft prints two parallel tracks on a piece of paper. See picture 2 at the lower part above. The printer starts to run, when the first lob of the second beam strikes the aircraft, the second lob did stop the printer. The lowest picture in picture 2, is a real photograph of the printout. The lower track of the two tracks, prints the azimuth value of the single beam , when the beam “strikes” the aircraft for a few seconds, eg. when the centre of the two beams is just pointing to the aircraft. In this case about 255 degrees. Null degrees was referred to true north. Which was remarkable. A station letter, also is printed (M) every 10 degrees. The upper track prints the signal strength of the received continuous signal of the two beams. It shows a very sharp dip, at which point, the exact azimuth value is given. The dual trace Hell printer HS 120, on board of the aircraft. The Bernhard/Bernhardine system was a medium range system. At a altidude of 4000 meters of the aircraft, the range was still about 350 km. At a altitude of 8000, it was about 400 km. Note: Most of the pictures are from the website of Frank Dörenberg. This picture represent the normal blind landing system, used at airfields! Picture above: My setup of the FuBl 2. 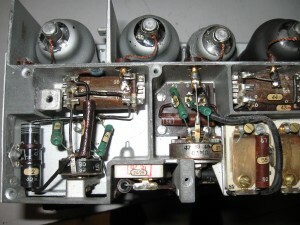 On the left the EBL 3 F receiver, a later version, on the right above, the EBL2 receiver. Just right below, the U 11, the power supply. On the left below, the AFN 1 indicator and the remote control of the EBL 3F, the FBG 2, for a chosen frequency channel. There were 34 channels, the last two were used for the Bernhardine system. As a FuBl 2 installation, the EBL 3 beacon receiver is working together with the EBL 2 marker beacon receiver. This is called the LFF , Landes Funk Feuer. In this situation, the Ebl 3 receives an automatic gain control (AGC) signal of the EBL 2, and the EBl 2 receives the audio signal output of the EBl3. When the EBl 3 is to work with the Bernhardine system, it is called then NFF, Navigation Funk Feuer, The FUG 120 takes over the place of the EBL 2. This is done by the SpKf 1a mode switch (picture 1). This switch is re-configurate the LFF to NFF by the switch box UG 120. The EBl 3 gets its AGC input signal from the FUG 120, and the FuG 120 gets its AF output from the EBl 3.
inside the receiver EBl 2. Added some new pictures of the inside of the EBL 2. Beautiful construction. 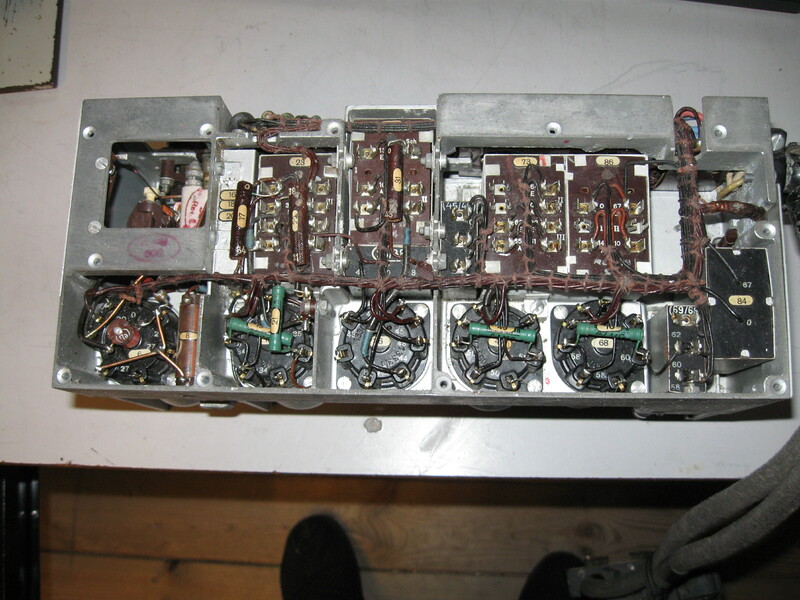 The inside of the EBl 2 receiver. The EBL2 module from the inside. Watch that typical connectors. 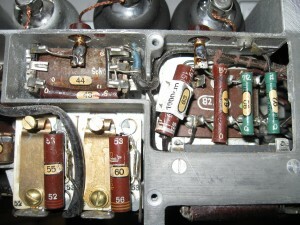 Also a lot a valves for the HF stage of the receiver. The sensitivity of the receiver was increased comparing it with a normal receiver for blind landing. 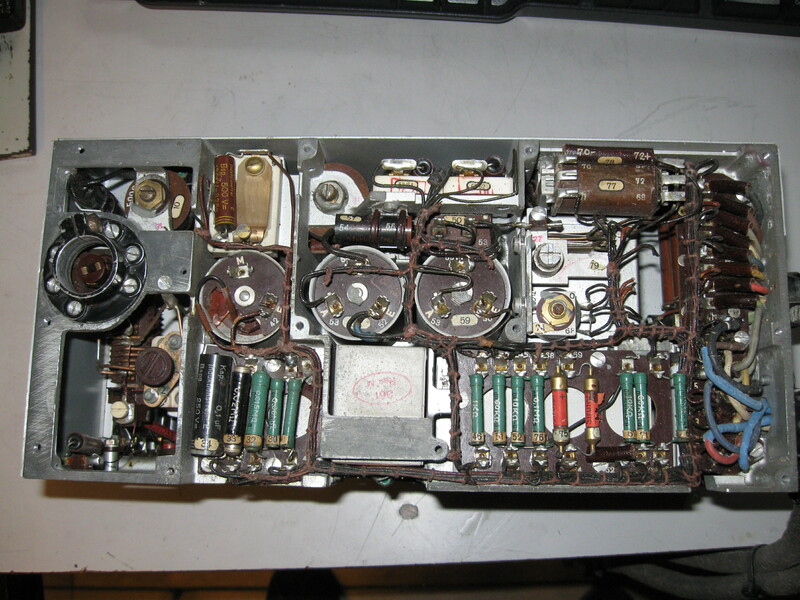 Note the typical connector, ” Kabelschwanze” called in German. I managed to let the EBL 2 working. But the receiver part cannot exist without the the EBL 3. Also inside the EBL 2 some LF parts With a very selective audio filter. Discription of the complete combination of EBL 2 and 3 will follow soon.